As lead vocalist on Jones Girls hits that have etched a permanent place in the minds and hearts of soul fans, Shirley Jones has a straight-ahead, uncomplicated style which makes tunes such as “You Gonna Make Me Love Somebody Else” and “Nights over Egypt” sound just as fresh today as they did 30-some years ago. She proved her ability to go it alone in 1986 with the quiet-storm favorites “Do You Get Enough Love” and “Last Night I Needed Somebody”; but most listeners probably don’t realize that her new album, My Time to Shine, is actually her fourth solo collection. As lead vocalist on Jones Girls hits that have etched a permanent place in the minds and hearts of soul fans, Shirley Jones has a straight-ahead, uncomplicated style which makes tunes such as “You Gonna Make Me Love Somebody Else” and “Nights over Egypt” sound just as fresh today as they did 30-some years ago. She proved her ability to go it alone in 1986 with the quiet-storm favorites “Do You Get Enough Love” and “Last Night I Needed Somebody”; but most listeners probably don’t realize that her new album, My Time to Shine, is actually her fourth solo collection. After reuniting briefly with her sisters in the early ‘90s for Coming Back (see our review of the CD reissue), she released the sophisticated With You in 1994 on London-based Diverse Recordings, and sixteen years later issued Feels Like Heaven independently. My Time to Shine, however, might be Jones’s strongest album yet. Where many of today’s neo-soul and retro-styled R&B recordings often bow to commercial interests in one way or another, the singer and her producers steer clear of easy tricks and frilly enhancements. Whether the soundscape be the take-no-prisoners groove of “Ready to Go” or the bluesy sway of “One More Time,” Jones treats each melody with a delicate balance of grace and sass, fully evoking the pure and heartfelt lyrical canvases. Perfectly embodying her grasp of forthright phrasing while enhancing the instrumental components of a tune, the title track, indeed, shines with Stax-inspired horn stylings, an irresistible rhythm track, and sly guitar licks working in tandem with Jones’s assertive stance of self-assurance and keeping it real. Meanwhile, the soothing, slow-swingin’ “Say” (lifted from the aforementioned With You) is a glowing reminder of her innate talent as a balladeer. Bringing home Jones’s continually positive stance of faith and patience, the introspective stepper “Because You Love Me” (released last year as a single) incorporates a classic Jones Girls vibe—courtesy of songwriter/producer Errol Henry—that is mellow in tone and celestial in melody. Gliding seamlessly from alto verses to soprano riffing after an appropriately spirit-lifting key change, Jones presents a convincing case for spirituality without any over-the-top semantics or preachy antics. Bearing a more contemporary rhythmic sensibility, the thought-provoking “We Are All One” shines the spotlight on excessive violence in society via simple yet affecting words: “Black lives matter/White lives matter/We’re in this together, we’re one.” Although the cameo male vocalist adds lyrically to the platform, his style is not quite in tandem with Jones and thus distracts the listener a bit from the overall atmosphere. Consistently authentic in its material and Jones’s delivery, My Time to Shine notably borrows several tracks from the previously alluded to Coming Back. 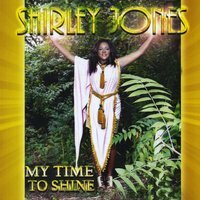 While it’s a bit questionable that these Jones Girls selections would be included on a Shirley Jones solo album (without mention of the original source), they are stylistically in sync enough with the new material to warrant an appearance here—especially as many stateside listeners are likely unfamiliar with them. The sunny “Merry Go Round” and entrancing “All I Want” are rich uptempo selections that add a nice balance to the set and further demonstrate Jones’s and producer Errol Henry’s organic chemistry. Recommended.